At this time of year, when winter is slowly fading away but spring is not here yet, it is always thrilling to see new growth. It seems as if new leaves just pop up overnight. The Easter lilies are already up and making a stark contrast with the dead leaves of palm grass behind them. I am hoping the palm grass comes back, soon. 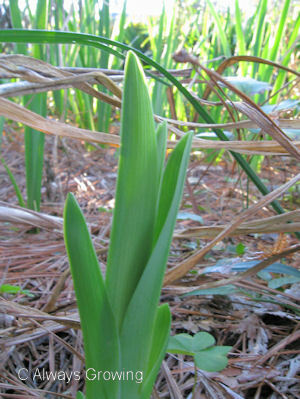 The Triumphator lilies that were placed in the garden last spring, are coming up also, and they seemed to have multiplied. Yah! Most of my daylilies are evergreen ones, but a few are not. 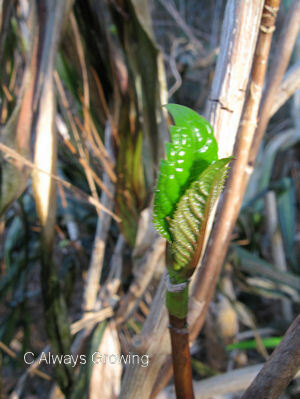 The dormant ones, too, are now showing green growth. Misty Mayhaw daylilies are up and seem vigorous in their early growth and should look very good this year. Finally, some of the shrubs are showing signs of life. The hydrangeas are opening their leaf buds already. This photo was taken a few days ago, and I am sure that by now the leaves are even bigger. While we still will probably have a few days of cold weather yet to come, there are definite signs that spring will arrive on time. 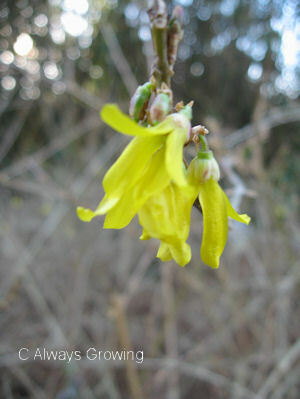 The first forsythia flowers have shown up. Yesterday, when I got home from work, it was still light enough to walk around the garden, and I was happy to see the first little gold bell on the bare forsythia branches. When the forsythia starts blooming, you know spring is on its way. Forsythia will bloom best here when we have a very cold winter. 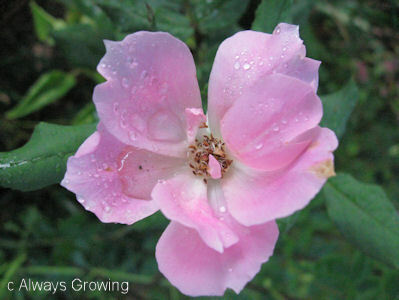 With the unusually cold weather we had in December, this should be a good year for blooms. I certainly was glad to already see this first sign of spring being on its way. I can feel my spirits lifting day by day. 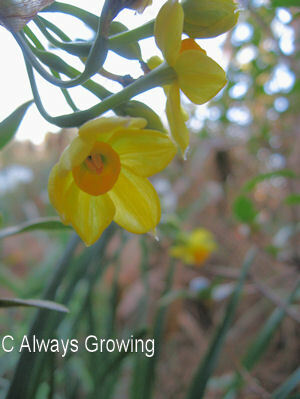 The flowers of late winter and early spring occupy places in our hearts that are well out of proportion to their size. About this time of year, when everything in the garden is dormant, I start to need to buy living things. Plants! I want plants. 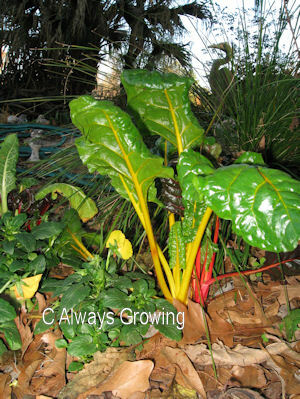 I want to garden, and it is so frustrating that now is not the time to be planting very much. But, by Sunday, I just had to have something. I stopped by Home Depot and decided if they didn’t have anything to buy yet, I would stop at the grocery and get some roses. As I walked in and almost immediately spied the bare root roses, I knew I would have to get some roses. There was a large display of the Knockout roses, and I was happy to see they had some of the Blushing variety which is often hard to find around here and is my favorite. I already have two Blushing Knockouts in one of the side gardens and will plant these new ones near those two. 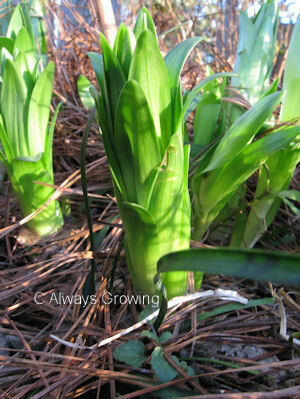 I also picked up a few lily bulbs which I will be planting very soon. Last week was pretty rough for me, so having a few new plants certainly lifted my spirits. It has been said that one of the signs you are still young is that you concentrate on the future. The future is where the young look. Well, that being said, I must still be young even though the calendar says a little differently. When it comes to gardening, I am always looking ahead. Spring it foremost in my mind right now, but after visiting my sister yesterday, I am tucking a few ideas of fall planting for winter color in the back of my mind. 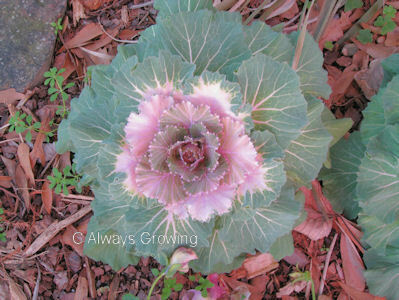 The recent freezing weather has the garden pretty bare of color. While this bleakness is unusual, it is not unheard of either. I am going to take a page out of my sister’s garden and plan for cold weather a little more than I have been. I usually put out violas or pansies for color, and I have also used snapdragons and petunias. Throughout the winter, I will have the hibiscus blooming and a few other tropicals as well, but not this year with so many days of freezing temperatures. So, next year, for insurance of winter color, I am going to try a few of the plants that made it through the cold weather for my sister and are now giving a lot of color. 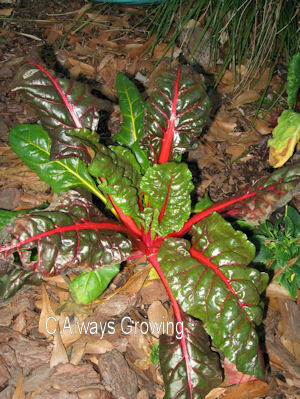 First, I want to put in some chard, like her bright red and yellow ones. 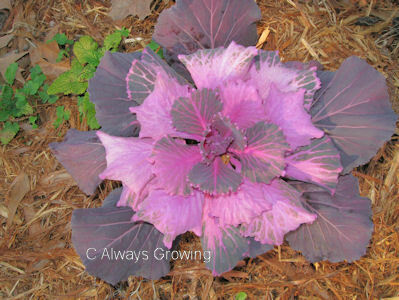 Several years ago, I tried ornamental kale, but it didn’t do very well; it wasn’t in an area with enough sun. I think it is time for me to plant it again. Yes, even though I still will be planning for spring and summer, plans for next fall’s planting for winter color are still on my mind. Our warm, mild weather has returned, and it is so nice to be back to normal, if not a little warmer than usual. I have been enjoying our high 60’s temperature after the recent cold. 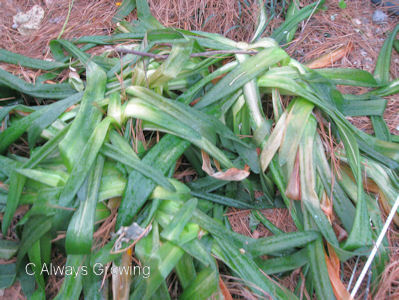 More freeze damage has shown up, but I don’t think that too many plants may be actually dead. 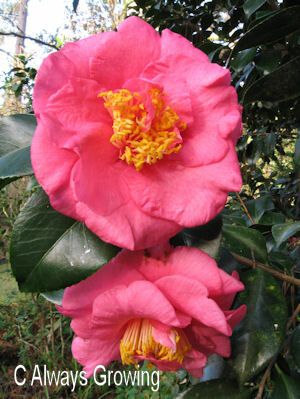 One sign that those subfreezing temperatures didn’t damage too much is our blooming camellias. Those buds that were still closed have opened with no damage. 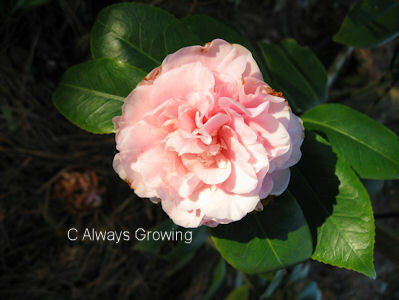 With so much of our garden cut back by the cold weather, it is nice to have the camellias blooming as normal. They certainly are standing out this year with little or no competition after the freeze stopped other plants from blooming. 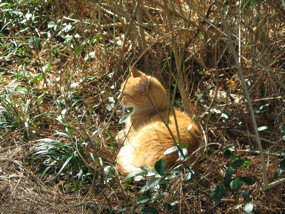 I would like to thank everyone who left such lovely messages about losing our sweet cat, Rusty. I appreciate the kind thoughts. I know there are worse tragedies in the world that grab your attention, so thank you again for taking the time to try and lift our spirits. Your comments do help. Today, we lost our sweet little cat, Rusty. 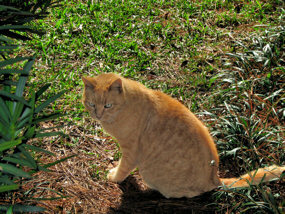 He was my garden cat and would always follow me around whenever I was outside and keep me company. He was perfectly behaved in the garden, never walking on plants, etc. We have several bird feeders and always had a great number of birds around, but Rusty was so laid back that the birds had nothing to fear from him. His death was so sudden and coming only about six weeks after we had to put our little white cat down, it just really has us so sad. I certainly loved that little guy and will miss him so much. At last the extreme cold weather has moved on, and we have more seasonable temperatures. Our internet connection has been down for several days, so I haven’t been able to post or check out other blogs, so I have a lot of catching up to do. Finally, the cold weather broke this last Thursday. I think this is the longest cold spell we have had since we moved here in 1976. I know that the temperatures were the lowest in over twenty years. Since I started gardening seriously just after then, many of the things I have planted have never had to take such low temperatures for so many hours. It looks like everything I covered made it through the ten days of freezing weather though most of the tropical plants look a little shabby. There were a few plants, that I was surprised that made it through even though they were covered, for example, our little mango tree that was started from a seed looks fine even thought it was only covered with plastic. The plants in the garden are another thing. I feel pretty confident that they will all return from the roots, but, of course, you just never know. 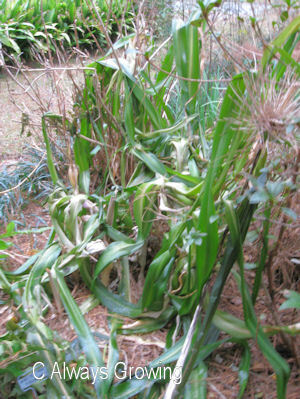 The agapanthus and crinums are all wilted; the gingers are all scorched-looking; the cannas, amaryllis, and calla lilies leaves are all lying down on the ground and will have to be cut off. I did mulch just about everything with a tremendous amount of pine needles and was pleasantly surprised to see how many tender perennials had green leaves underneath the mulch. One example is pineapple sage ‘Golden Delicious” that seemed to have survived under the pine needles. I really didn’t think it would. It does look like I have lost the regular pineapple sage which I have had for over ten years in the back garden. Of course many things didn’t seem affected by the cold at all. The Easter lilies are just fine and are now about four to five inches tall. 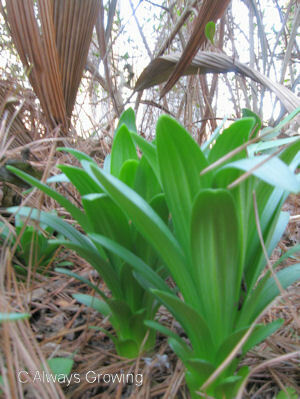 The evergreen daylilies’ foliage came through the cold with no problem. Some of the sages did, too. 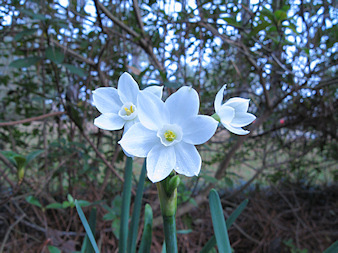 Of course, there are no flowers in the garden right now except for the paperwhites and violas. This is very unusual. When I look at previous January posts, there are so many winter blooms, but not this year. Not having more flowers in the garden certainly makes me look forward to spring coming even more than normal. This is it, just about the only flower showing right now.